If you love working with kids and seeking a foot in the door to your first full-time job, a position as a Babysitter is an excellent place to start. Even if Babysitting is just an interim career choice because you are still studying, these roles may give you the opportunity to gain working experience which will help to secure a permanent job later on. Often these Babysitter roles can also turn into permanent positions too as childminders or nannies for the rich and famous. 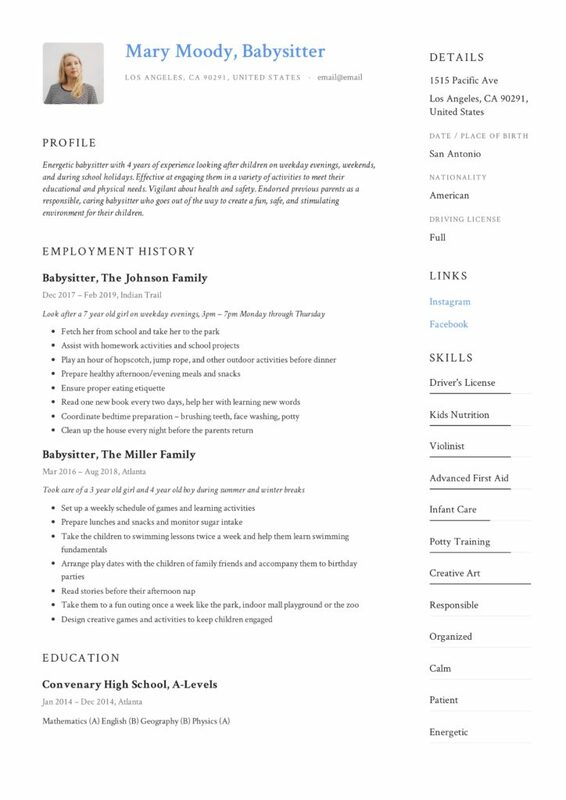 However, with so much emphasis placed on child development and child safety, it is necessary to produce a stellar resume to potential employers (parents). Start by viewing our top-notch Babysitter resume samples. You want to ensure that your resume stands out from the rest by being both informative and entertaining to read without overwhelming the reader with irrelevant information. Be sure to include alternative contact channels as well, such as your Linkedin profile URL details. On the subject of email address, create a professional one on Gmail or use your university student email address. 2. Career Summary: View this as the introduction to your resume and include 1-3 sentences giving a broad overview of your background and relevant experience. You should be specific and state which role you are applying to. 3. Qualifications Summary: Provide accurate details about the certifications and qualifications you have completed with the institution, qualification name, and dates. Don’t forget to include the qualifications you are currently pursuing. 4. 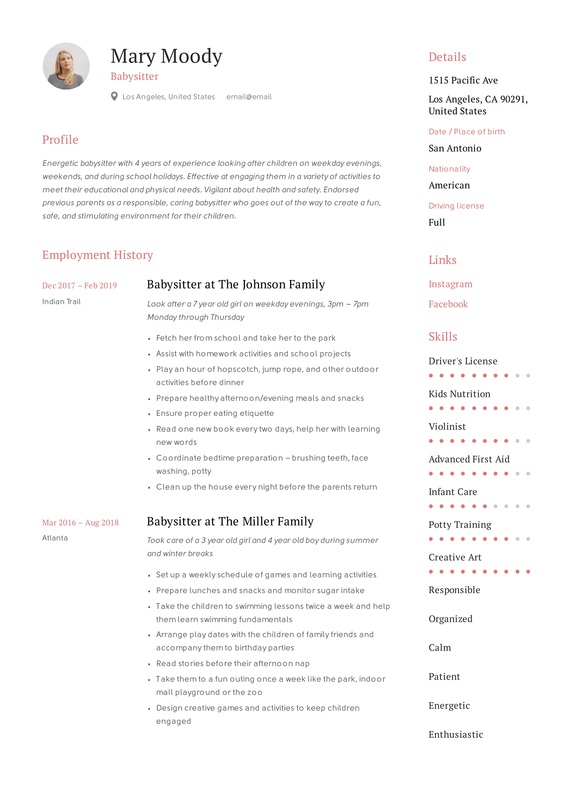 Relevant Babysitting Experience: Indicate your previous Babysitting jobs, part-time gigs, official and unofficial vocation employment history. Use brief sentences with bullet points to list your most important daily activities under each role you have had. 5. Other Employment Experience: If you are permanently employed in a full-time position, Babysitting may be a temporary or part-time venture for you once a week or, a few times during the month. In this case, you may add your career history for the last ten years as you would when applying for a permanent role. 7. Education/Licenses/Certifications/Relevant Coursework/Training: As you would typically have no formal working experience yet, because most baby sitters are still in high school or busy completing their degrees at university, you need to provide detailed information on the qualifications you do have or are in the process of completing. There are a few essential details parents need to know about you to ensure that you are the right fit for their children. Babysitting is a very informal type of job, and there is a difference between a baby sitter role and an au pair or nanny job. While both play a role in supervising and caring for children when parents are away, a nanny is a daily job with fixed hours. Babysitters are short-term caretakers who are typically hired to watch the children for a set period. Babysitters often stay with children while their parents go on a date, or meet the children after-school if the parent have a meeting. The first aspect to highlight is the ages of children you are comfortable with to watch. Therefore, you need to mention whether you have looked after infants, toddlers, elementary school kids or even high school kids. If you have experience in babysitting special needs children be sure to mention that as well. Next, parents want to see if you are responsible and what your work ethic is like. If you have no previous babysitting experience add your casual experience where you may have assisted at the farmers market part-time, help to organize the annual county Christmas event or being a tutor for mathematics during your high school years. The key here is information and lots of it. Another important consideration for a parent to hire you, would be the scope of your tasks for instance whether you can prepare meals, help with homework, change nappies, and interact or play games with small children. Furthermore, your mobility would be a deciding factor too. If the role requires you to pick up children from school, you need to have your drivers license. Other things like whether you can swim or if you know basic First Aid could be what lands you the job or not. Finally, mention whether you will travel to the client’s house or office or if you are going to look after the child/children at your premises. A new trend is after school or even 24hour childcare centers where Babysitters will be hired by the center on a per hour basis. Be sure to stipulate precisely what type of Babysitting role you would prefer. The locations you are available to work in and whether you are willing to travel. Also, mention the hours and availability you have. Apps like Calendly or Bookme gives parents the opportunity to quickly view your availability and book your service online. Written references can do wonders for your credibility so don’t forget to add them. Your GPA score is important as well, especially if the role requires you to do some impromptu tutoring of assist with homework. Any other languages you are familiar with even if it is just a basic competency will also be of interest, especially for parents who are expats from other countries. Input your extracurricular activities. These can include activities that you do outside of school such as sports, formal clubs and organizations (Girl Guides, Scouts), and information clubs (book club, gaming club). Listing extracurricular activities on your resume isn’t required, but it shows parents that you have a wide variety of skills and interests which is beneficial, especially if these align with the interests of your potential employer! Parents can be very particular about the personality traits of the person they are going to entrust their children to. 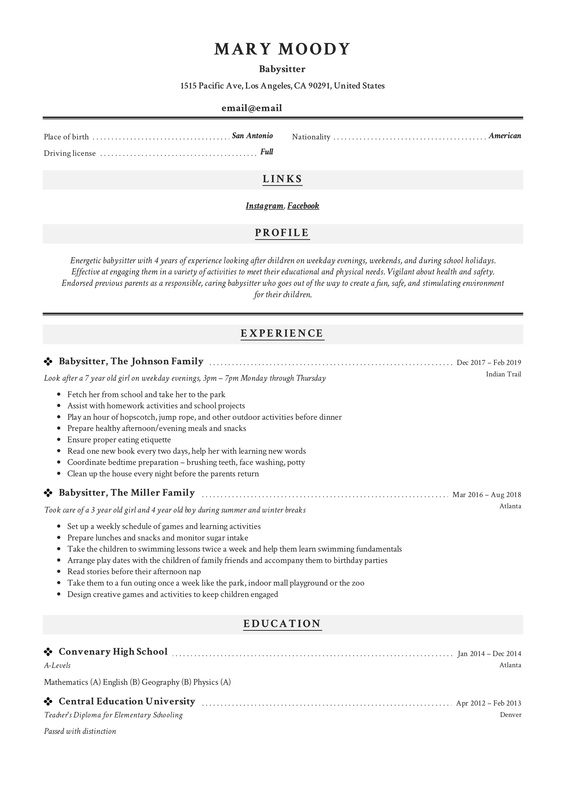 Your resume needs to stand out amongst the applications. Keep your career summary concise and to the point. 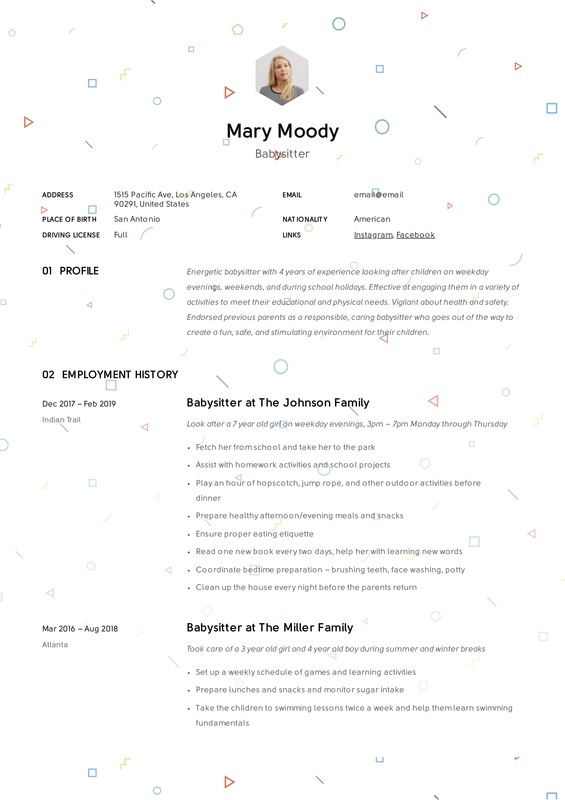 Start your career summary with a little detail about your personality. 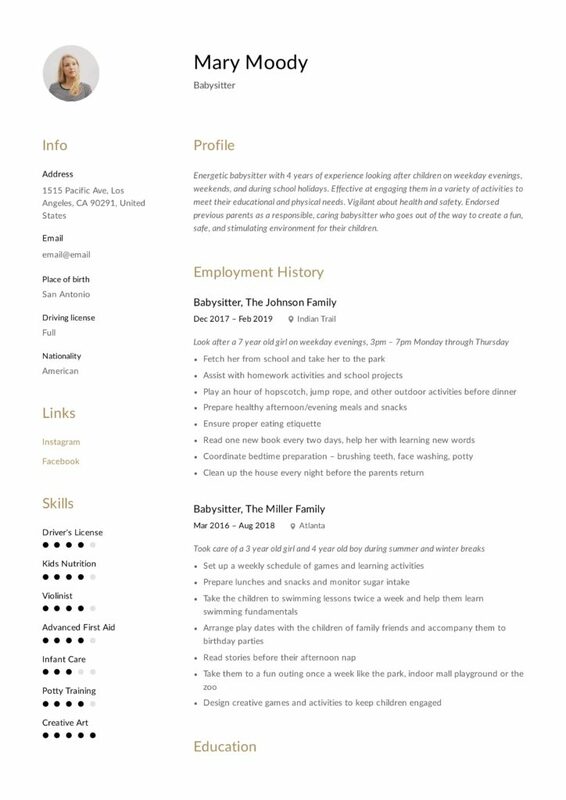 Then mention the degree that you are currently completing and finish off with the reason why you are interested in the advertised Babysitter role. 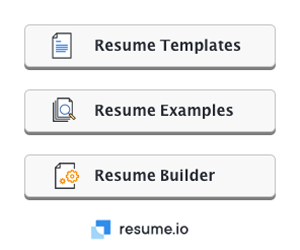 Very important to note: you need to customize your career objective for every role you apply to by using the buzzwords listed in the job description. Your career objective should not be a one size fits all paragraph. For instance, if the job you are applying emphasizes an energetic personality or detail orientated work ethic use those phrases in your resume if you have that type of skill. 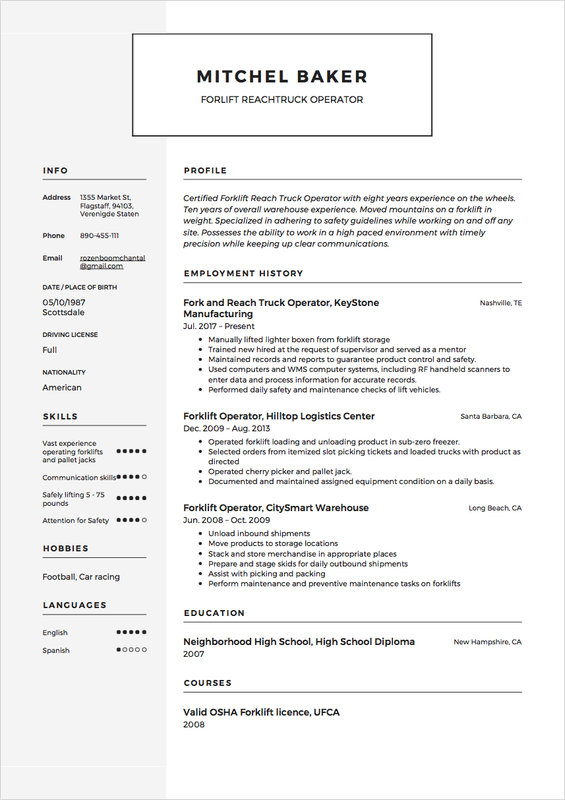 The more your resume resonates with the job description of keywords, the better fit you will seem. Perhaps add a line that showcases any outstanding qualities that will add value to the family. A parent would be interested to know if you are punctual and reliable, are safety conscious or have creative problem-solving abilities and also if you can ‘’think on your feet” in times of crises. Energetic babysitter with two years of experience looking after children on weekday evenings, weekends, and during school holidays. Effective at engaging them in a variety of activities to meet their educational and physical needs. Vigilant about health and safety. 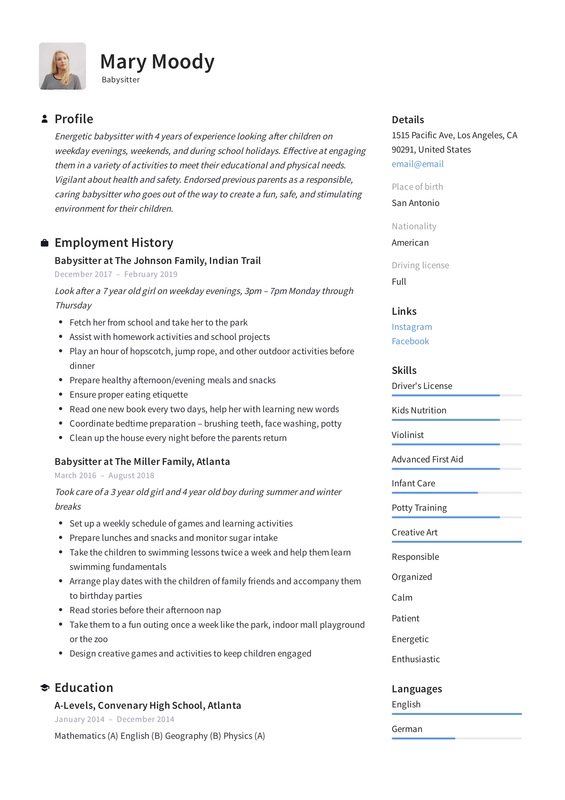 Endorsed previous parents as a responsible, caring sitter, who goes the extra mile to create a fun, safe, and stimulating environment for their children. Elementary teacher with five years of experience and a fun loving nurturing personality, performing babysitting duties at her premises during weekends. Loving nature and creates a stimulating play and learning environment at her premises. Also provides a fetch and drop off service to potential parents. 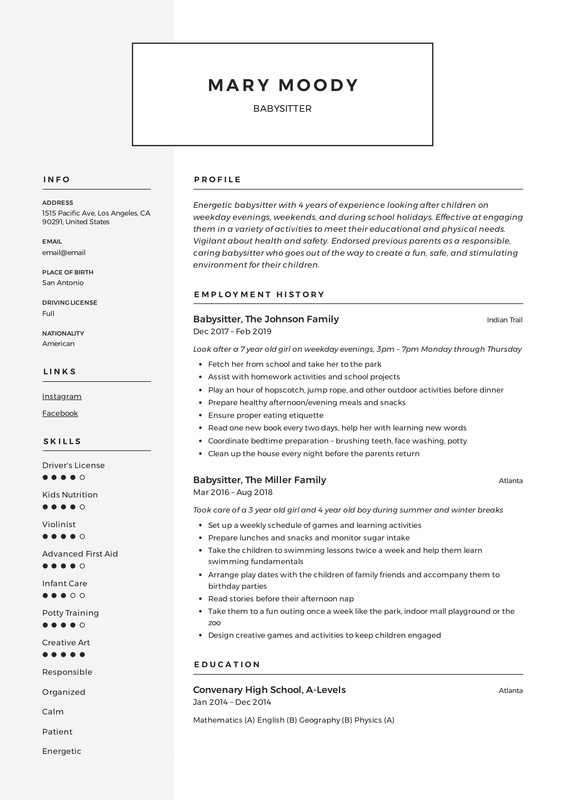 Mature and dependable student, with volunteer experience working as a summer camp leader, and one long term gig as a baby sitter for two 5-year-old twins twice a month. Can sleep over on weekends. Ability to monitor, control and manage the kids efficiently. 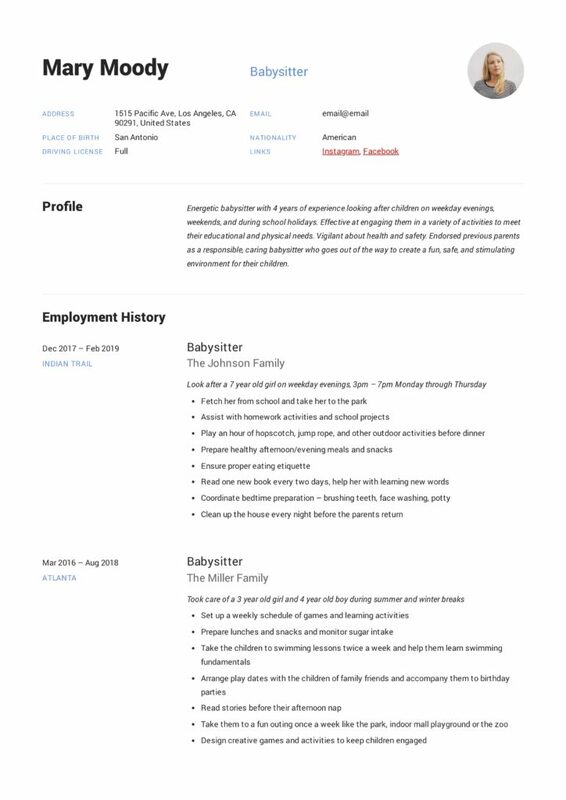 Enthusiastic babysitter with a warm, caring, and nurturing personality and the ability to form quick bonds with elementary school children. Currently studying teachers diploma and has completed CPR, Basic First Aid and Kids Nutrition Course in the last year. Has a clean criminal and driving record. Comfortable at handling and caring for kids of any age in the absence of their parents. Build a solid reputation as a trustworthy babysitter, and you’ll never be out of work. A parent would expect to see details regarding your main tasks and duties completed during previous Babysitting roles. A Babysitter’s main responsibilities are to look after the children, helping them play games, making them indulge in fun activities and also notify issues to parents if necessary. 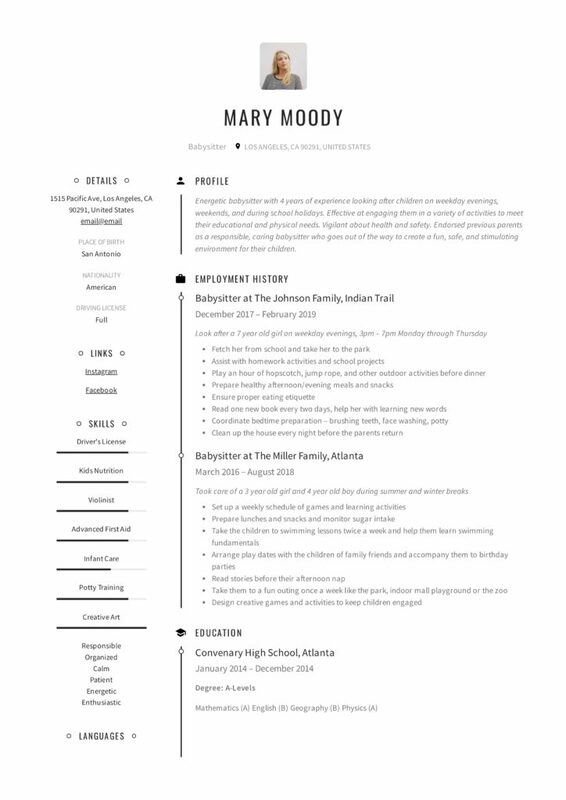 Typically, when listing work experience, you would include position title you held, the name of the division you worked in, the name of the company, and its location. When listing previous Babysitting experience, you would include the name of the family you babysat for, the dates of employment, together with the city and state. 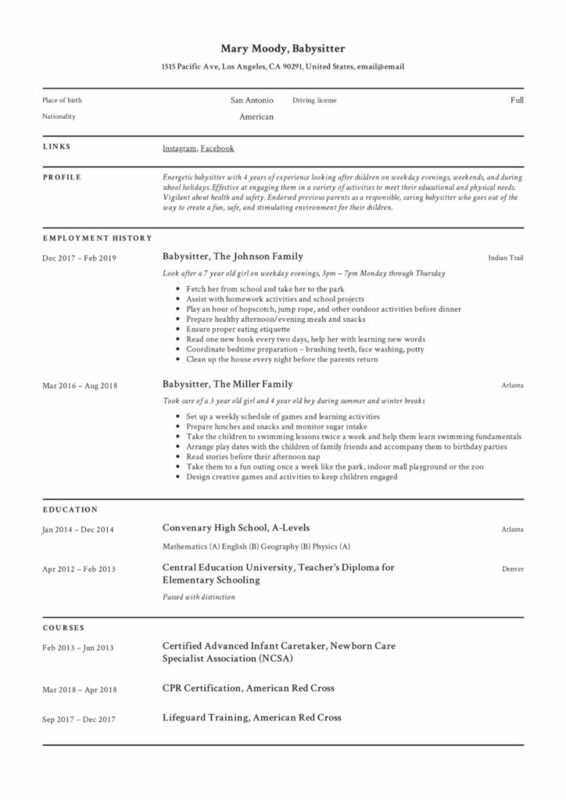 You should also list each job in chronological order (at the top the most recent role). 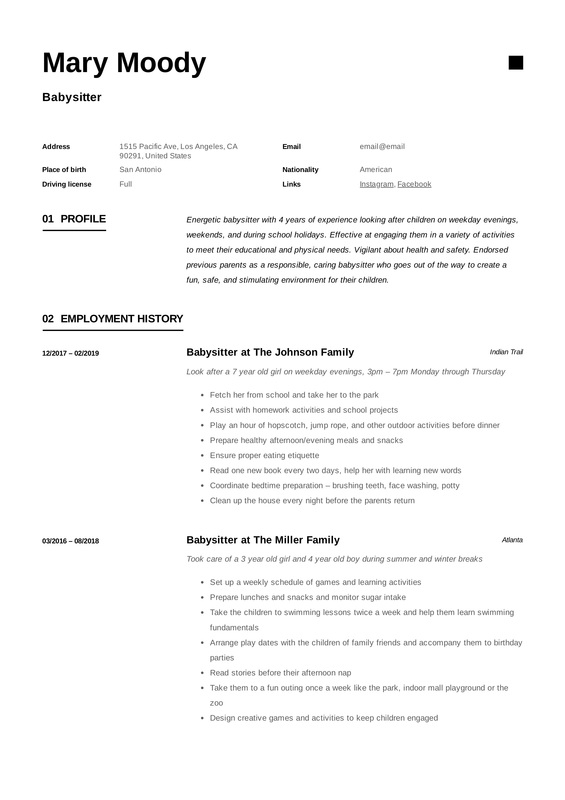 Herewith a few generic Babysitter job descriptions to help you in listing the duties you performed on your resume. Remember to be specific about the frequency of your work, hours worked at a time, number of children and ages of children. 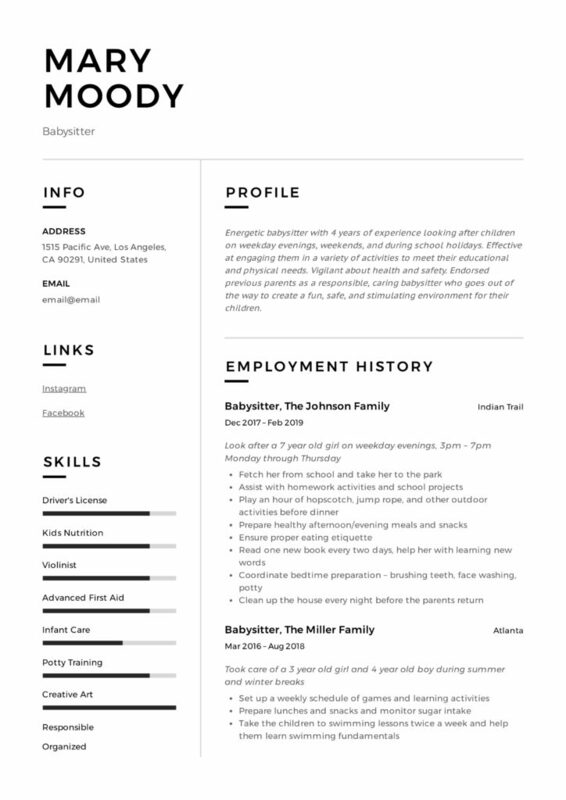 The education section forms an integral part of your resume especially if you do not have much full-time experience or if this would be your first Babysitting job. In short, just indicate What, Where and When regarding your qualifications, certifications or courses obtained. The name of your qualification, institution, and date of completion is more than sufficient. Remember to mention current qualifications you are in the process of completing. Regarding courses and certifications, discretion and relevance must be considered. Think about what parents would be interested in hearing about, for instance, that you are a certified to care for infants, you have completed a CPR course or that you are busy with your Elementary Education Teachers Diploma. Educational Attainment: A university degree is usually not required to become a Babysitter, but any courses or diplomas related to child care is beneficial for example CPR and First Aid. Technical Aptitude: Meal Preparation, Laundry, Homework Assistance, Games, Sports, Art, Music, Swimming, Diaper Changing, Potty Training. Salary indication: Average rate is about $7 to $15 per hour. May vary according to the number of kids and whether you are working weekdays or weekends.